Title: 05/04/1987 - Evaluation of labeling system which was designed to meet the requirements of the HCS. This is in response to your letter of April 14 regarding your company's labeling system which was designed to meet the requirements of the Occupational Safety and Health Administration's (OSHA) Hazard Communication Standard. In addition, if containers of hazardous chemicals are shipped, the name and address of the chemical manufacturer, importer, or other responsible party must also appear on the label. The standard's preamble also recognizes the existence of the numerous labeling systems that are currently in use in industry. The intent of the standard is to permit the use of these systems as long as the employer's entire Hazard Communication Program (HCP) is effective. In assessing an employer's compliance with the standard, an OSHA compliance officer will evaluate the effectiveness of the employer's inplant labeling system through a review of the employer's material safety data sheets and training program. An effective program would be one that ensures that employees are aware of the hazardous effects of the chemicals they may be exposed to as well as meeting the other basic requirements of the standard. 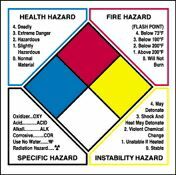 Hazard warnings used as part of inplant labeling systems, in combination with the HCP, are deemed to be effective when they promote safe handling and use of hazardous chemicals in the workplace. From the label decal enclosed with your letter it appears that the chemical identity and health hazard warnings appear, in addition to a numerical hazard rating system. As long as the hazard warnings and/or ratings are correctly selected it appears your labeling system would meet the inplant labeling requirements of the Hazard Communication Standard. Please note that for shipped containers your labeling system could not rely on a numerical rating system and would have to be supplemented with the appropriate hazard warning(s) in a narrative form and include the target organ effect as well as the physical hazards of the chemicals.